In the summer of 2015 Steven Berghuis moved abroad. The son of former international Frank Berghuis signed a 4-year contract for Watford, leaving AZ after a good season finishing 3rd in the Dutch league. Watford did spend an amount of around 6.5ME for Berghuis. Berghuis only played 9 games at Watford in the 2015-2016 season. 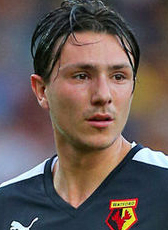 In August 2016 Berghuis went on loan to Feyenoord for the 2016-2017 season. In July 2017 Feyenoord signed the winger on a permanent deal until 2021. In May 2016 Berghuis played his first cap for the Dutch national team against Ireland. He is the 9th Dutch player whos father also played for the national team.